This example models resistive Joule heating where the resulting current from an applied electric potential will heat a thin spiral shaped Tungsten wire, such as can be found in incandescent light bulbs. The filament reaches an equilibrium temperature where the internal heat generation is balanced by radiative heat loss through the boundaries. Two physics modes are involved, conductive media DC for the electric potential V, and heat transfer for the temperature T. Since the coupling is one way where only the heat transfer source term depends on the potential, the model will be solved in two steps. First for the electric potential, and then for the temperature using the pre-calculated potential, this saves computational time. This model is available as an automated tutorial by selecting Model Examples and Tutorials... > Multiphysics > Resistive Heating in a Tungsten Filament from the File menu. Or alternatively, follow the step-by-step instructions below. To start a new model click the New Model toolbar button, or select New Model... from the File menu. Select the 3D radio button. Select the Conductive Media DC physics mode from the Select Physics drop-down menu. Press OK to finish the physics mode selection. The filament geometry will be imported from an STL file Instead of creating it with the built-in CAD tools. Select Import Geometry > STL Format.. from the Geometry menu, and choose the resistive_heating1.stl file to import. The STL file has been prepared with each boundary in a separate STL section. Automatic boundary detection is therefore not required, uncheck the corresponding checkbox to disable this. Leave the other settings at their default values and press OK to import the geometry. Switch to Grid mode by clicking on the corresponding Mode Toolbar button. The built-in grid generator does not support imported CAD geometries so the external Gmsh grid generator is recommended (Gmsh will automatically be downloaded and installed if not available when selected). Press the Settings Toolbar button. Select Gmsh from the Grid generation algorithm drop-down menu. Enter 5e-4 into the Subdomain Grid Size edit field. Press the Generate button to call the grid generation algorithm. Press OK to finish and close the dialog box. Switch to Equation mode by clicking on the corresponding Mode Toolbar button. Enter 1/52.8e-9 into the Electric conductivity edit field. Switch to the + tab. Select the Heat Transfer physics mode from the Select Physics drop-down menu. Press the Add Physics >>> button. Enter 19.25e3 into the Density edit field. Enter 133.9776 into the Heat capacity edit field. Enter 173 into the Thermal conductivity edit field. Enter the expression 1/52.8e-9*(Vx^2+Vy^2+Vz^2) for the temperature source term, effectively coupling the gradient of the electric potential to the temperature field. In the first step, only the potential V will be solved for, so deactivate the temperature by clicking on the Active button. This will deactivate a selected physics mode in the specific subdomains, or here deactivate it completely. Press OK to finish the equation and subdomain settings specification. Switch to Boundary mode by clicking on the corresponding Mode Toolbar button. Apply a potential difference of 0.2 V between the two ends. Select 57 and 58 in the Boundaries list box. Select Electric potential from the Conductive Media DC drop-down menu. Enter 0 into the Electric potential edit field. Select 58 in the Boundaries list box. Enter 0.2 into the Electric potential edit field. Switch to the ht tab. To specify the radiative boundary condition, select Heat flux for all but the end boundaries and enter the coefficient for the radiative Constant and surrounding ambient temperature Tamb. Enter 5.670367e-8 into the Radiation constant edit field. Enter 80+273.15 into the Ambient temperature edit field. The end boundaries are assumed held at room temperature. Select Temperature from the Heat Transfer drop-down menu. Enter 20+273.15 into the Temperature edit field. Press OK to finish the boundary condition specification. Now that the problem is fully specified, press the Solve Mode Toolbar button to switch to solve mode. Then press the = Tool button to call the solver and solve for the active potential field. After the problem has been solved FEATool will automatically switch to postprocessing mode and here display the computed electric potential. To solve for the temperature field, switch back to Equation mode activate the heat transfer physics mode and de-activate the electric potential. Press the active toggle button. Switch to Solve mode by clicking on the corresponding Mode Toolbar button. The current solution has to be used as initial guess to use the computed potential since it is deactivated, also decrease the Non-linear relaxation parameter to help with convergence. Select the Computed solution radio button. Enter 0.8 into the Non-linear relaxation parameter (ratio of new to old solution to use) edit field. After the solver has converged, plot the temperature and verify that the maximum temperature is around 690. Press the Plot Options Toolbar button. Select Temperature, T from the Predefined surface plot expressions drop-down menu. Press OK to plot and visualize the selected postprocessing options. 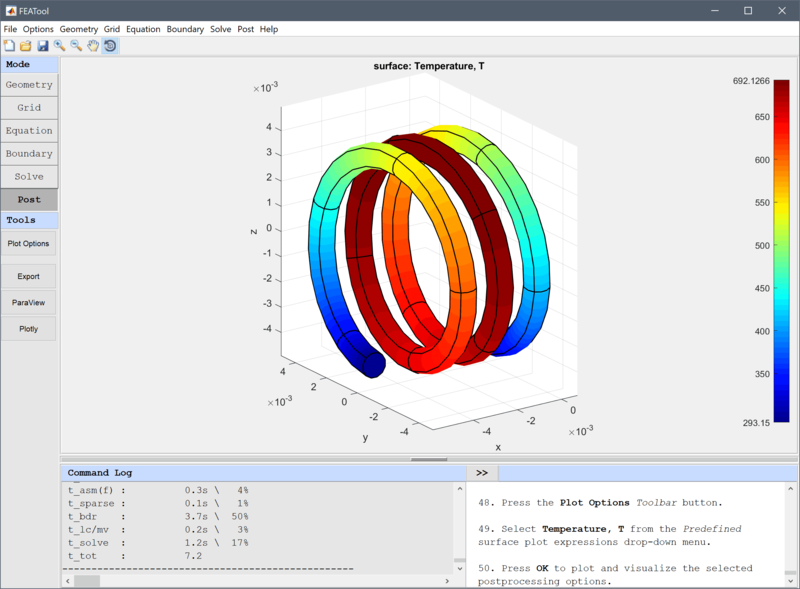 The resistive heating in a tungsten filament multiphysics model has now been completed and can be saved as a binary (.fea) model file, or exported as a programmable MATLAB m-script text file, or GUI script (.fes) file.